Cadre, an online investment marketplace, has raised $65 million in Series C funding, something the company says it will use to lower the barriers for investors who want to put their stake into alternative assets, such as real estate. 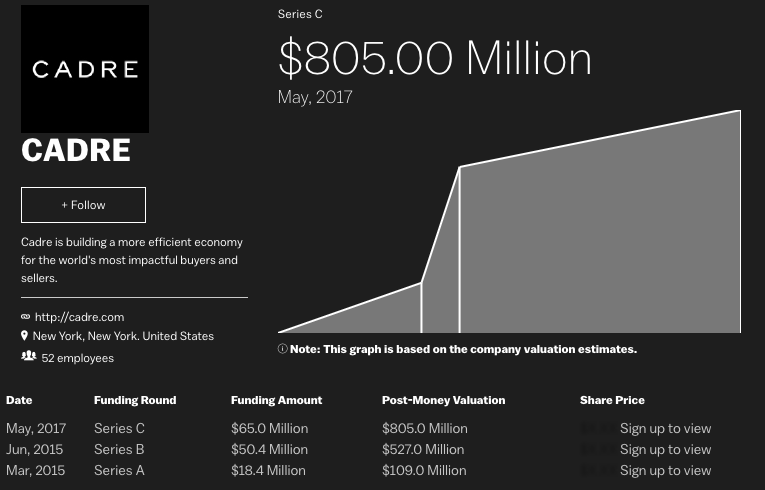 Cadre, an online investment marketplace, has raised $65 million in Series C funding, led by venture capital firm Andreessen Horowitz. The company describes its platform as “a smarter, data-centric approach to investing, enabling broader participation and better investor outcomes.” Cadre’s platform automates key investment processes, and its team uses data science for a quick turnaround on analyzing individual assets and identifying market-level trends and opportunities. Andreessen Horowitz general partner Jeff Jordan says the firm’s large investment in Cadre represents its love of marketplace businesses that “bring efficiencies to previously inefficient markets.” Jordan believes that Cadre’s platform will open the doors of investing for alternative asset classes, namely commercial real estate. While the Cadre marketplace is primarily focused on commercial, Williams’ background includes billions of dollars in transactions across asset classes, including residential real estate, specifically at Goldman Sachs and then Blackstone, a Wall Street giant known for acquiring single-family rental homes. Last year, Cadre scooped up a suite of residential buildings, populated with millennials and retail stores, for $60 million. Jordan notes commercial real estate investments have consistently yielded returns higher than the S&P 500, and that Cadre’s focus on transparency, low fees and access to deal-by-deal discretion is perfect for investors looking to invest in this industry. Additional participants in the funding round included Jim Breyer of Breyer Capital, Ford Foundation, General Catalyst, Goldman Sachs, Khosla Ventures and Thrive Capital. Cadre’s existing investors include DST, Founders Fund, SL Green and others. In previous funding rounds, Cadre raised $68.8 million, and Cadre CEO Ryan Williams said this round’s level of investment represents significant growth and will enable the company to expand into additional markets, further develop its data program and grow its technology and real estate teams.